Posted August 19, 2013 by laurielmorrison & filed under Middle Grade Literature, Series on creating engagingly fallible narrators, The Writing Process, Young Adult Literature. Last week, I recommended five books that I’d especially enjoyed reading this summer. Looking back on that post, it occurs to me that my five recommendations have something in common other than my admiration: they’re all written in the first person. I know that isn’t unusual, especially since most of those books are contemporary young adult novels. And I’m not complaining. I’ve heard plenty of people say they get impatient with seeing one first-person YA book after another, but I love the intimacy of a good first-person story, and I usually write from that POV, too. Recently, I finished (for now) working on one first-person contemporary YA novel and shifted to another. One of the biggest challenges for me right now is making sure that the voice of the main character in my new project rings true and stays distinct from the voice of the main character in the project I was working on before. Because I have first-person narration on my mind, today I’m going to share some thoughts on the rise of the first person in fiction for children and young adults, its challenges, and its possibilities. I did some research on the history of the first person in fiction for young(ish) people a couple of years ago, when I was beginning my critical thesis at Vermont College of Fine Arts. I learned that writers of young adult fiction began to embrace the first person in the 1950s, after the publication of The Catcher in the Rye in 1951. According to the late children’s book editor Jean Karl, before then, the consensus was that books for young readers “must never be told in first person” because first person was “too difficult for children” to negotiate (200). 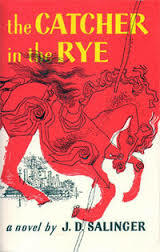 But in the years after The Catcher in the Rye came out, first-person point of view became the default choice for what scholar Lois Kuznets calls the “problem-oriented domestic story,” in which the adolescent narrator defines himself “in direct opposition to surrounding adults” (188-9). Lots of people raise valid concerns about first-person narration. Sometimes first-person narrators provide too much internal narration, and then a story can drag or the protagonist can come across as self-centered. Sometimes first-person narrators sound too much like other first-person narrators. Sometimes they lose credibility if they notice details during heated moments that nobody would be likely to pay attention to. There’s more, too. Henry James scorned the use of first person, especially when the protagonist is a child or adolescent, because young people “have many more perceptions than they have terms to translate them” (qtd. in Kuznets 190). So in Henry James’s view, when writers confine themselves to the thoughts a young person can articulate, they sacrifice richness of language and restrict their ability to capture what that young person thinks, sees, and feels. Also, Kuznets points out that when writers use first-person narrators, they encourage readers to feel a “quick, relatively unquestioning identification” with the protagonist, and Kuznets is concerned that this unquestioning identification reflects a “naïve” way of reading because readers should learn to think critically about what they read and to see beyond one protagonist’s point of view (189). Scholar Mike Cadden has a similar concern. In his article “The Irony of Narration in the Young Adult Novel,” he points out the paradox of first-person YA novels: authors strive to capture an authentic and engaging adolescent voice, but unless they are, in fact, adolescents at the time of writing, their first-person teen or tween voice can never actually be authentic (146). The problem here, for Cadden, happens when an adult narrator knows that her narrator-protagonist has some limited or misguided views, but she conveys the narrator-protagonist’s perspective so convincingly that the target readers accept that perspective fully without seeing any of the flaws in it. Sheesh. When there are so many challenges for people who want to write first-person fiction, why bother? For me, there are a few main reasons. First, I love the intimacy of a first-person novel, and kids and teens do, too. Second, it’s a lot of fun to craft and to read a distinctive first-person voice. I’m not saying a third-person voice can’t be idiosyncratic and engaging, because it certainly can. But I adore first-person voices that capture the essence of a specific character and let me, as a reader, get to know/admire/worry for/love that character in a deep way. 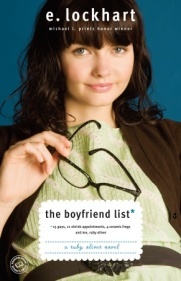 (Some of my favorites include E. Lockhart’s Ruby Oliver from The Boyfriend List and the other Ruby books; Louise Rennison’s Georgia Nicolson from Angus, Thongs, and Full-Frontal Snogging; and Jaclyn Moriarty’s Lydia and Emily from the Ashbury/Brookfield books.) As a writer, I like to try to create characters whose voices capture their distinctive, charming, and—yes—sometimes limited ways of seeing the world. Third, as I said last week in my notes about Lisa Graff’s Umbrella Summer, I love books that feature fallible narrators, who are some way limited or misguided in their perceptions, especially when readers know that the narrators are fallible. This can happen in books that are written in other POVs, too. But it’s especially powerful to identify intimately with a first-person protagonist and to recognize the flaws in that protagonist’s ways of seeing herself, others, and/or the world. It’s a moving reading experience to know and love the character deeply, while also rooting for that character to change or grow more self-aware. In both my critical thesis and my graduate lecture at Vermont College, I considered ways that writers of middle grade and young adult first-person fiction can help readers to see the limitations in their narrators’ perspectives so that readers both identify with and see beyond the characters. Inspired by Ingrid Sundberg’s excellent series on organic architecture in fiction (which you should check out if you haven’t already), I’m going to feature some of those strategies in my next few blog posts. In the meantime, I’d love to hear your thoughts on all things first person: pet peeves, favorite first-person narrators, challenges you’ve faced, and more! Karl, Jean. “The Process of Finding the Voice in Realistic Fiction for the Middle-Aged Child.” The Voice of the Narrator in Children’s Literature: Insights from Writers and Critics. Ed. Charlotte F. Otten and Gary D. Schmidt. New York: Greenwood Press, 1989. 199-205. Print. Kuznets, Lois. “Henry James the Storyteller: The Development of a Central Consciousness in Realistic Fiction for Children.” The Voice of the Narrator in Children’s Literature: Insights from Writers and Critics. Ed. Charlotte F. Otten and Gary D. Schmidt. New York: Greenwood Press, 1989. 187-198. Print. Wonderful post, Laurie! I never realized there were so many objections to first-person narration. I have to laugh at this: “authors strive to capture an authentic and engaging adolescent voice, but unless they are, in fact, adolescents at the time of writing, their first-person teen or tween voice can never actually be authentic.” That’s why it’s called FICTION, Mr. Cadden. And someone who conveys the perspective convincingly is called A GOOD WRITER. John Green writes very convincingly. And he’s an adult! Who knew, right? And Sarah Dessen is pretty convincing, as is Deb Caletti in THE SECRET LIFE OF PRINCE CHARMING. And Judy Blundell pretty much rocked WHAT I SAW AND HOW I LIED. Lately, I’ve been writing in close third. Close third feels right for the stories I’m writing. But I love first-person narration, and will return to it at some point.